Until recently, Barcelona was a city best known for its football, architecture, climate, and culture. 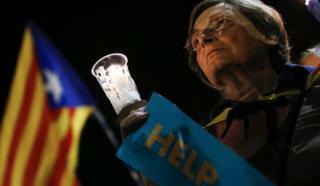 Few overseas were aware of the political tensions in the Catalan capital. On 1 October, a disputed referendum was held in Catalonia, asking whether the region should be an independent state. This vote was suspended by Spain's Constitutional Court, which later declared the result - which organisers said was a resounding "Yes" - void. A little more than a week later, Catalan President Carles Puigdemont signed a declaration of independence but immediately suspended its implementation. Spain's Prime Minister Mariano Rajoy responded by asking the Catalan government to clarify whether or not it had declared actual independence, setting a final deadline of 19 October for a response. Madrid has threatened to suspend the region's autonomy. But what do those on the ground in Barcelona have to say? On independence: "It's a step backwards in history, and a huge contradiction to the message of the EU; the notion of creating a community, not creating barriers. Politicians are leading people when it should be the people who lead politicians. I find it very, very sad." On losing autonomy: "Catalonia is [already] losing something worse than just its autonomy; it is losing businesses day after day. That's what worries me as a young person soon to be entering the labour market." How would a breakaway affect you? : "I feel Catalan, yet I also feel Spanish. I do not see the sense of creating barriers in societies. Many things have to be changed, but independence is not the solution." On independence: "The Catalan secessionist leaders need to put an end to the pro-independence project. There needs to be fresh elections to the Spanish and Catalan parliaments." On losing autonomy: "I'm afraid that the Catalan institutions are not exercising their legal and political obligations. One cannot lose autonomy that one is not exercising." How would a breakaway affect you? : "I fear it would lead to a loss of rights, economic instability, a lowering of or an inability to maintain pensions, an automatic EU exit, and greater unemployment across Catalan society." On independence: "Catalonia is more likely to adapt and succeed if it is independent; it is also the only way to preserve the Catalan culture, history, identity, and language." On losing autonomy: "There are already research centres and universities that have had to suspend projects because the Spanish government has frozen their bank accounts. It is an aberration that I see to be the repression of Catalans." How would a breakaway affect you? : "An independent Catalonia is the only way for future generations to live in a socially fair and economically prosperous country. I do not want my children to live in a country that constantly scorns the Catalan identity and its symbols." Image caption Jordi: "I want Catalonia to be an independent country with a republican regime"
On independence: "Not only is there an unwillingness to negotiate over the independence of Catalonia, there is also an absolute denial of dialogue about the possibility of a legal referendum with all possible democratic guarantees. Renouncing independence is to return to a time more than 40 years ago, and to lose everything that has been fought for over decades." On losing autonomy: "The fear that Catalonia will lose its autonomy is always there." How would a breakaway affect you? : "The impact on my life will be important, as well as [the lives] of everyone. Personally, I could lose my job at the service of the Catalan administration."